On May 25, 1861, James O’Meara, a veteran of the newspaper business, decided to abandon the Oregon Sentinel, a small Democratic paper that he had published in Jacksonville since his arrival there two years earlier. [i] Many papers in 19th century Oregon went through several owners throughout their existence – the business seems to have attracted a class of itinerant newspapermen and women, making O’Meara’s short run at the Sentinel unsurprising. However, the choice to leave his work as an editor and writer is embedded in the larger context of the Civil War and the federal government’s effort to suppress Democratic newspapers, making the circumstances in which he left more intriguing. O’Meara is one among countless others who were intimidated and, against the threat of financial loss, violence, or arrest, were forced to quit the newspaper business during the Civil War. Image 1: Taken from Occidental Messenger (later the Democratic Crisis), Corvallis, Oregon, October, 1857. Image 2: Taken from the Democratic Standard, Portland, Oregon, February 1858. O’Meara’s alignment with the national Democrats put him in an interesting ideological position. 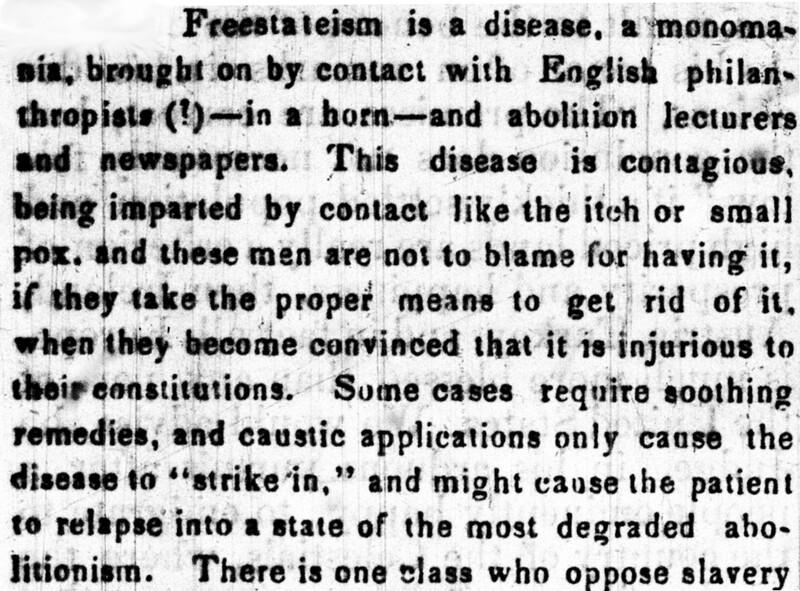 Unlike the Occidental Messenger, which considered abolitionism a “disease” and slavery a Biblically ordained institution that should exist in Oregon (see Image 3), the Standard did not conflate the debate over national abolitionism with a state’s right to outlaw slavery — some newspapers argued that admitting any new territory as a free state to the Union served the abolitionist agenda. The terms of the debate for O’Meara were not about combating abolitionism, but rather were steeped in the language of state sovereignty. This ideological split was reflected in the larger conflict between national and state democrats, but not always with clean, predictable results. For example, while national Democrats tended to be more ambivalent about, if not resistant to slavery, they still supported Joseph Lane’s record as a pro-slavery Democrat, revealing inconsistencies in their strategic goals. Image 3: Taken from the Occidental Messenger, Corvallis Oregon, October 1857. Although O’Meara charted a careful course between Democratic “freestateism” and Republicanism, making his political views less of a direct threat to Oregon Republicans, he would eventually face significant backlash as the beginning of the Civil War approached. He moved on from the Standard in 1859, relocating to Jacksonville to publish the Sentinel. Working on a Democratic paper in Jacksonville was less risky, as the Democratic Party tended to have strongholds in smaller towns in the state. The Sentinel originally appeared as the Table Rock Sentinel with William G. T’Vault, a prominent newspaperman and Democrat, as editor. T’Vault had established the paper with the intent of providing a voice for the Democratic Party in Oregon. The July 30, 1859 issue announced: “We contributed our mite to the admission of Oregon as a slave State. Advocating the adoption of the proslavery clause in the constitution, with the belief that the constitution of the United States secures to all citizens the right expressed in the popular sovereignty principles… when they form a State constitution preparatory to their admission into the confederacy as a sovereign State.” While there would be some continuity in the paper’s tone as it shifted from T’Vault to O’Meara, the latter would offer a more moderate publication during his tenure as editor. O’Meara’s “salutary” appeared in September 1859. In a standard introduction, he stated that the paper would be Democratic, but independent – not heeding the proscriptions of any particular faction within the party. He immediately took a conciliatory stance toward his former adversaries, the state Democrats, in following issues. Anticipating the split in the Democratic Party that would later help Lincoln win the presidency, he called for greater solidarity, suggesting that past disagreements were not over principle and were merely personal. Along these lines, he lamented the arrival of independent candidates in elections for county representatives, believing they would draw votes away from the Democratic Party. Departing from this calm discourse, however, the Sentinel intensified criticism of Republicans as local elections drew close. The Sentinel extended this line of criticism to the Republican Party after Lincoln’s nomination. In a June 30, 1860 issue, O’Meara expressed some astonishment at the results of the Chicago convention, writing, “Lincoln’s name was scarcely broached in the high political circles, and we are not aware that a single Republican paper of any distinction spoke favorably of him in connection with the position.” In fact, O’Meara argued, Lincoln’s success was not evidence of any remarkable quality he possessed as a politician, but was ultimately the result of tensions within the Republican Party: “It seems… that bitter antagonism upon the part of a few leading men in Republican ranks to Mr. Seward and Mr. Bates, but especially Mr. Seward, more than any popularity in himself, which resulted in securing to Mr. Lincoln the nomination.” Without Seward, the editorial suggested, “[Republicans] would be divided into… every phase of anti-slavery, from tender-footed Free-soilism all the way to the most fanatical of treason-plotting Abolitionism, each as hostile to the other as all… are to Democracy.” In O’Meara’s view, the Republican Party, like the Whig Party, was not defined by principled approaches to political issues – it was reactionary. The Sentinel continued to run articles that chastised Republicans and celebrated the Democratic Party, eventually leading to a backlash from members of the community. In January of 1861, O’Meara expressed a degree of anxiety about his paper’s reception. In the first issue of volume six he attempted to allay tension by acknowledging the potentially inflammatory content of his paper. In an article titled, “The New Volume,” he admitted “that in the late heated political contest words were spoken and sentiments expressed by many, that under less aggravated circumstances, would never have found creation in the brains nor emanated from the lips that gave them.” O’Meara suggested the Sentinel served the community by reporting important, local news and attracting businesses and new settlers to Jacksonville. However, the paper did have a political identity, something he was not necessarily apologetic about. Instead, he thanked subscribers who bought his paper regardless of their disagreement with his political positions. While he called for greater understanding and patience, he also lamented the unusual plight of the editor (see Image 4). 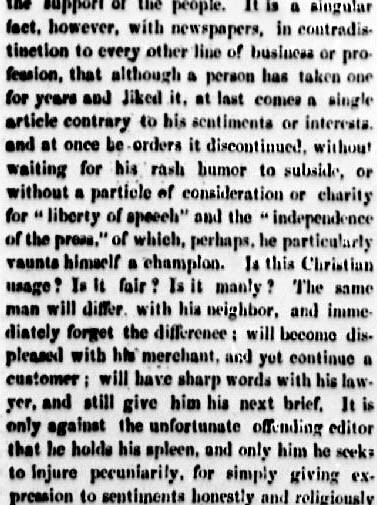 While someone may claim to respect “liberty of speech” and “independence of the press,” once they are confronted with an opinion they disagree with, O’Meara states, it is “the unfortunate offending editor… he seeks to injure pecuniarily, for simply giving expression to sentiments honestly and religiously entertained, and which were expressed under an impulse of duty alike to readers and himself.” As is evident in the editorial, this phenomenon was not uncommon – it was something he experienced more than once while at the Sentinel. Unfortunately for O’Meara, this last effort to calm the atmosphere was fruitless. He was forced to leave his post when local Republicans successfully boycotted the paper. The next issue appeared with Denlinger and Hand, new arrivals, listed as editors. In a “Salutory,” Denlinger and Hand attempted to soften the abrupt transition between owners, probably anticipating O’Meara’s depiction of events as a hostile take-over (O’Meara published a final article, which is discussed below, that suggested he was forced out). The new editors suggested they were apolitical, having a general incapacity for publishing long articles with a partisan slant. 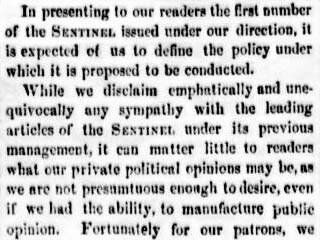 They also disclaimed “emphatically and unequivocally any sympathy with the leading articles of the Sentinel under its previous management” (see Image 5). An article on the Civil War immediately followed the salutary. Denlinger and Hand revealed their political orientation and also offered a backhanded assault on O’Meara, directly contradicting their earlier claims. Of secessionists they wrote, “[W]e say, emphatically, such men are not to be trusted, and their treason should be crushed to the earth with all the speed and force available.” Reminiscent of Lincoln’s use of the public safety clause, they argued that “the good, quiet, orderly citizens have been overcome by the few plotting, reckless and ambitious demagogues.” Secessionism was a doctrine advanced by a small minority of agitators like O’Meara who needed to be silenced in order to preserve the Union. Given the circumstances surrounding newspaper suppression, O’Meara was optimistic in his belief that a Democratic paper could survive even with generous financial support from like-minded subscribers. According to “Bud” Thompson, a noted Oregon newspaperman of the time, some papers would be suppressed more than once. Of the Democratic Herald (previously the Albany Democrat) and its editors he remarked: “Publication would be suspended for a week or so and then come out under another name… Thus Miller and Noltner [the editors] struggled along, issuing their publication under three or four different names. There was talk of providing Mr. Miller a residence at Fort Alcatraz… at the expense of the United States government.”[ix] The threat of imprisonment at Alcatraz was not hollow; General George Wright arrested a California editor for similar provocations. [x] While arrest did not appear to be a concern for O’Meara, he would be confronted with the difficulty of having multiple papers suppressed. His later project, the Southern Oregon Gazette, was banned from the mails for treasonous content in 1862. The Sentinel was unique for a few reasons. Although the early Oregon historian, Harvey W. Scott, characterized O’Meara as a “fire eating secessionist,” his connection to the anti-slavery wing of the Democratic Party suggests he was a member of a moderate minority among his contemporaries. He did support the secession movement, but his defense of a state’s right to secede was not couched in overtly racist or violent terminology as was the case with other Oregon papers. For these reasons, the Sentinel fell in a gray area – it was never officially banned by Wright as a danger to public safety, but was suppressed by the community through a boycott and intimidation. In the following year, 1862, five papers would be denied access to the mails. Suppression was somewhat short-lived, however. Wright grew frustrated as it became evident that suppression cases had little to do with public safety and were largely the result of partisan bickering. He suggested Democratic papers had no significant “influence tending to the injury of the Union cause.”[xi] Mirroring the national trend, early attempts to stifle the press declined as the war progressed. It became evident to members of the Lincoln administration that Democratic papers posed little threat to the war effort or the Union. In Oregon, suppression only lasted a few months and most editors affected returned to their lives with little change. [i] For a brief historical sketch of the Sentinel, see Jason Stone’s essay on the ODNP website. [ii] Bulla, David W. 2009. “Abraham Lincoln and Press Suppression Reconsidered”. American Journalism: the Publication of the American Journalism Historians Association. 26 (4): 11-33. [iii] Missouri is an interesting example, its level of newspaper suppression closely related to the fact that it was a slave state that joined the Union. The governor, Claiborne Jackson, was a pro-slavery Democrat who wanted the state to join the Confederacy. This coupled with the fact that a significant portion of the population was pro-southern explains why federal suppression occurred here with greater frequency. [iv] Manber, Jeffrey, and Neil Dahlstrom. 2005. Lincoln’s wrath: fierce mobs, brilliant scoundrels and a president’s mission to destroy the press. Naperville, Ill: Sourcebooks. The description of Lincoln as a media president is taken from the introduction. [v] Jeffery Alan. 1999. War & press freedom: the problem of prerogative power. New York: Oxford University Press. 103. [vi] Carey, Charles Henry. 1971. General history of Oregon through early statehood. Portland: Published by Binfords & Mort for the Peter Binford Foundation. 515-516. [vii] Chandler, Robert J. “Crushing Dissent: The Pacific Coast Tests Lincoln’s Policy of Suppression, 1862.” Civil War History 30 (September 1984): 235-54. 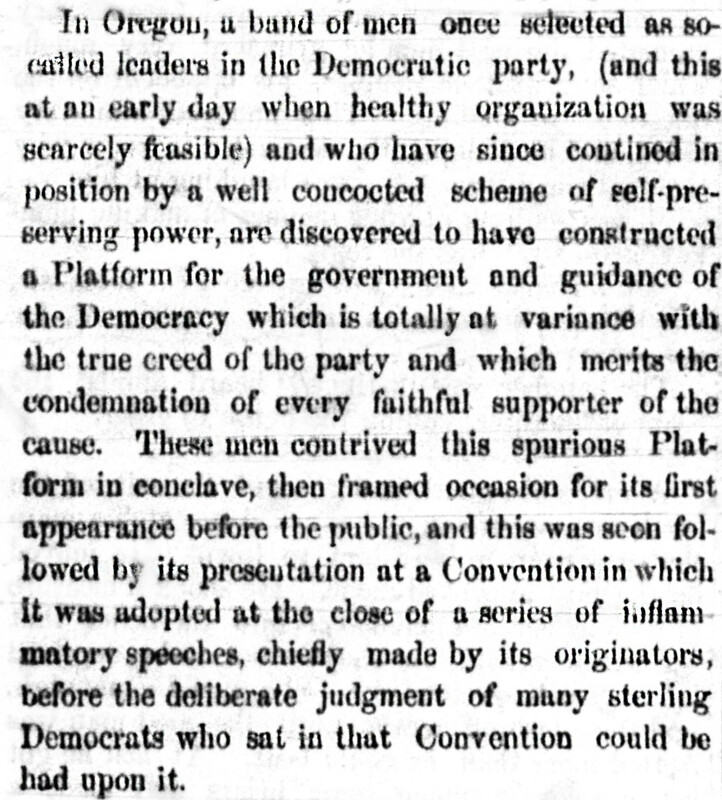 [viii] Taken from the May 25, 1861 issue of the Sentinel. [ix] Taken from Turnbull, George Stanley. 1939. History of Oregon newspapers. Portland, Or: Binfords & Mort. 275-276. [x] Taken from Chandler. Interestingly, some of the first civilian prisoners at Alcatraz were arrested for voicing dissenting opinions during the Civil War. ‹ Ring in the New Year with more Oregonian content!